Designed for the perfect glide while still allowing control and grip. This long-lasting crème is perfect for deep tissue and sports massage. 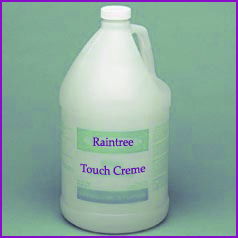 It is less viscous than some brands and it's greaseless feel is a product of the highest quality oils. It's functional ingredients allow the skin to be penetrated, nourished and moisturized while at the same time offering a lasting glide. Clients will never feel the need to shower or even wipe off, the product will be absorbed into their skin naturally. This facilitates ultimate convenience for on-the-go clients. No cheap salad oil ingredients - Only the highest quality oils are used. Some manufacturers talk up one suposedly magical ingredient while filling the product with low grade oils such as canola. Oils - Contains Grapeseed, jojoba, apricot kernal, Vitamin E shea butter and lavendar! Free Sample -- Buy our 8 oz. Sample and recieve full purchace price credit on your next order. Jojoba oil is widely known for it's deep penetrating and quick absorption qualities. Jojoba Oil is also an excellent emollient. Apricot Kernel Oil is rich in the essential fatty acids: oleic and linoleic. Apricot oil is known for its ability to penetrate the skin without leaving an oily feel. Its moisturizing, revitalizing properties are also popular in many cosmetics for dry or aged skin. Apricot kernel oil is also popular as a massage oil and it used as a carrier oil when used with essential oils for aromatherapy. Sweet Almond Oil is an extremely popular oil sought after for its rich concentration of oleic and linoleic essential fatty acids. Almond oil is used in the cosmetic industry for its penetrating, moisturizing and restructuring properties. Almond Oil is also used as a massage oil and is valued as a carrier oil when used with essential oil for aromatherapy. X-10 LOTION - "TAN KEEP"
Our lotion designed for preserving and prolonging your airbrush tan. X-10 Should be applied 3 or 4 hours before tanning and again after 8 hours (after shower). It is enriched with super moisturizers to keep skin healthy while slowing cell turn-over rate and has added DHA to prolong the tan. 2)Moisturize three hours before tanning. 4) Weight at least eight hours then bath and re-moisturize.